I've been craving this simple enoki mushroom soup that I had at my favorite Japanese restaurant back home so I've been on this crusade to make my own. While not quite the same, I like the version that I've managed to come up with. It's a simple recipe and although not quite a lunch time bento I've brought it in a thermos for breakfast after a brisk walk to work in the Sydney "winter" (I put that in quotes, it's so far been more like a chilly rainy fall than any winter I've experienced in Texas). I digress. After a bit of hunting and improvising this is what I ended up with. Let's start with the ingredients. As you can see it's a pretty simple soup: I have 100g of fresh shitake mushroom, 250g enoki mushroom, Dashi broth package, Soy Sauce, Chinese Mi Jiu 米酒 (Since I didn't have Sake or Mirin, but I like this better, less of a sweetness), and salt to taste. Yup that's it! First I remove the stems from the shiitake caps and slice them thin. I also cut off the end of the enoki mushroom bunch and separate them into small 1/2 inch bunches. I know the conventional wisdom is not to wash mushrooms, but Alton Brown did a good enough job convincing me otherwise besides, they were going into the stock pot for soup so what's the harm. Next I heat two quarts of water and I disolved 1 packet (6 grams) of dashi granules. Add 2 tbsp of soy sauce and 2 tbsp of Mi Jiu and bring the broth to a boil. Once there I lower the heat to a simmer and drop in the mushrooms and cook for about 20 mins. If you like some heat I would suggest adding some white pepper. Done! Delicious and very simple. Also most stores also carry a Kombu dashi which would be a fine substitution for regular dashi if you want this to be a vegetarian/vegan soup. Clean mushrooms, remove stem from Shiitake mushrooms and slice thinly. Cut off base of Enoki Mushroom bunch and pick off small "bunches" about 1/2 inch thick. Turn down to simmer and add Mushrooms. Simmer for 20 mins. Add salt and white pepper to taste. Not In A Box: So it's taken some time but we have steadily been making our way through Sydney's various suburbs (think neighborhoods, not the big expansive suburbs we know of in Texas) and have discovered some neat places to eat along the way. I figure for posterity (and if anyone actually comes to visit) I should keep track of some of these places. I posted about the ramen place but I'll start collecting putting them up here in batches. So this is part one of hopefully many. 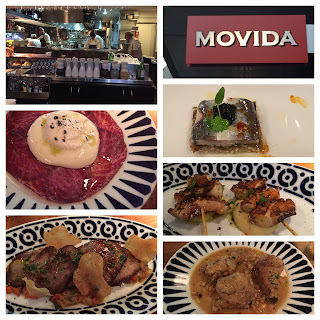 Movida, we first visited this place (rather the sister location "Movida next door") on our trip to Melbourne. 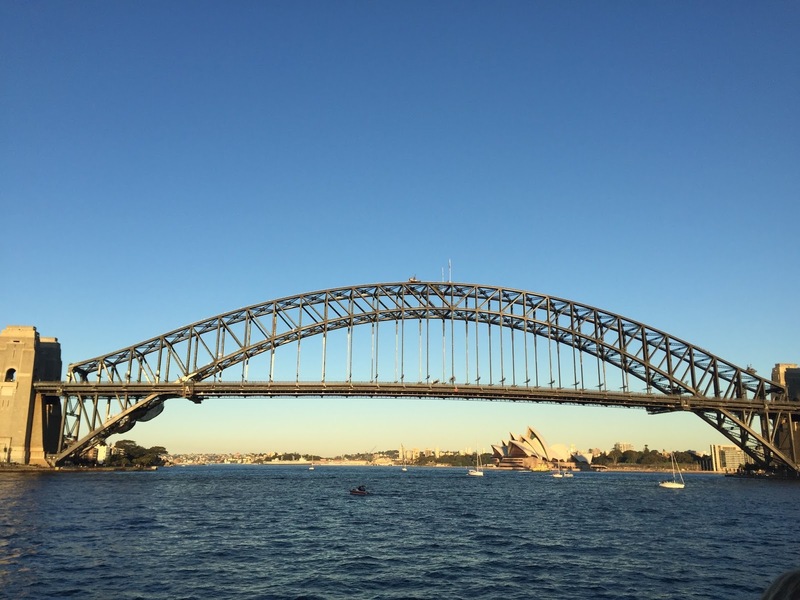 We were delighted to find out that they had a location in Sydney a short 30 minute walk away from our place. As with most places the restaurant was completely booked (we arrived just as they opened) and we ended up seated quickly at the bar. 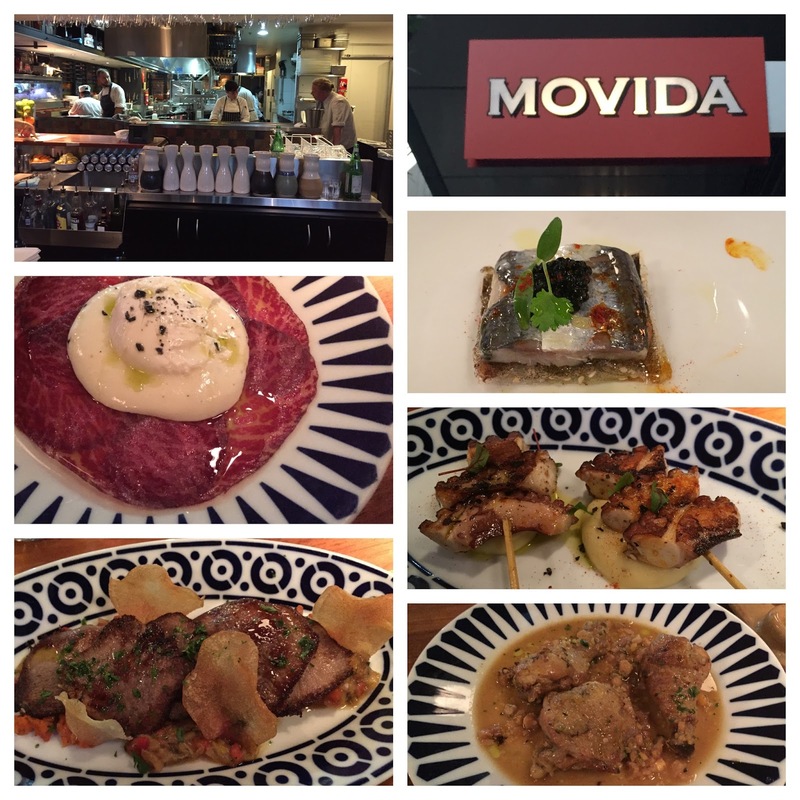 We had the Sardina (Sardine fillet with Cod Roe and Avruga Caviar), Cecina (air cured wagyu with truffle foam and poached egg), Lengua a la Plancha (Grilled Ox Tongue), and the Pintxo de Pulpo (grilled Galician Style octopus). We shared exactly what you saw and left perfectly satisfied. It was great being able to look in the kitchen and watch everything being prepared. We'll be bringing visitors to check this place out it's a great casual meet up place. My wife managed to ferret out a few places while I was back in the US for work. Baccomatto Osteria is a great little Italian restaurant, very open and cleanly decorated. 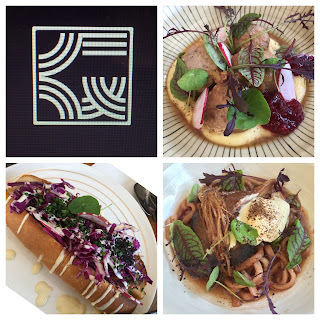 Like many places here in Sydney it's easy to miss, it was situated next to a boutique hotel in the quiet neighborhood of Surry Hills, I would have mistaken it for another townhouse had she not been leading the way. 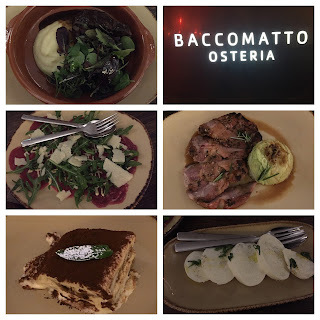 We had wagyu beef cheeks, carpaccio, fennel grilled pork neck, bufala mozzarella (made from buffalo milk), a tiramisu. This place was booked solid, they were able to seat us at the bar since we didn't have reservations, ultimately we were lucky enough to be transferred to a table later on, super friendly, nice staff and great food with a lot of attention to detail. Another find from my wife: Edition coffee roasters, they did a brisk business turning out coffee but java isn't the only thing this place serves up. It's a Japanese Nordic fusion place serving brunch and breakfast. It's located in the Darlinghurst suburb. We shared the Wild boar meatball, Porco Rollo (braised pork with Tamago), and my wife's favorite "Mushroom Pond". The "Pond" was Udon noodle soup with a couple of types of mushroom, mushroom cream in a warm mushroom broth. She almost made me order my own since she was unwilling to share but I convinced her I only wanted a taste. 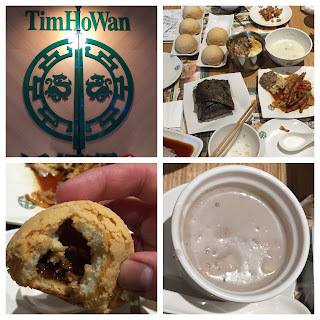 A coworker of my wife brought in some Chinese bbq pork buns and she declared that we had to go try this place Tim Ho Wan. I didn't know this at the time, but apparently this chain has earned One Michelin star and has earned the title "least expensive Michelin star restaurant". Located upstairs from the Chatswood train station in the food court, this location is pretty newly opened. There was already a line when we got there, but since it was only two of us we were almost immediately shown to a table. The dim sum was fresh and tasty but the call out was the baked bbq pork bun. Usually the pork buns at dim sum are a steamed bun with a sweet pork filling heavy on the bread side. This was very different. It had a crispy/flaky golden slightly sweet exterior with a delicious bbq pork mixture inside. You can see in the picture they came in orders of three and we ordered a second set to take home. (You can't order them to go, but you can order extra and take it home). For dessert I ordered the Taro sago, a lightly sweeten taro dish with tiny tapioca pearls, I surreptitiously ate the whole thing while my wife was distracted by the pork bun. There's quite a few sushi restaurants here in Sydney most of them have the train that goes around the restaurants. It's efficient they put the sushi, nigri, sashimi, appetizers and desserts on the moving train and you just pick the plate as it drives past you. They color code the plates so the wait staff can quickly come over and tally up your meal. It's an efficient business. Umi is the first one of these places that I've actually enjoyed quite a bit. Their train features some more unique items even Uni/Sea Urchin (my favorite) which is a rarity. 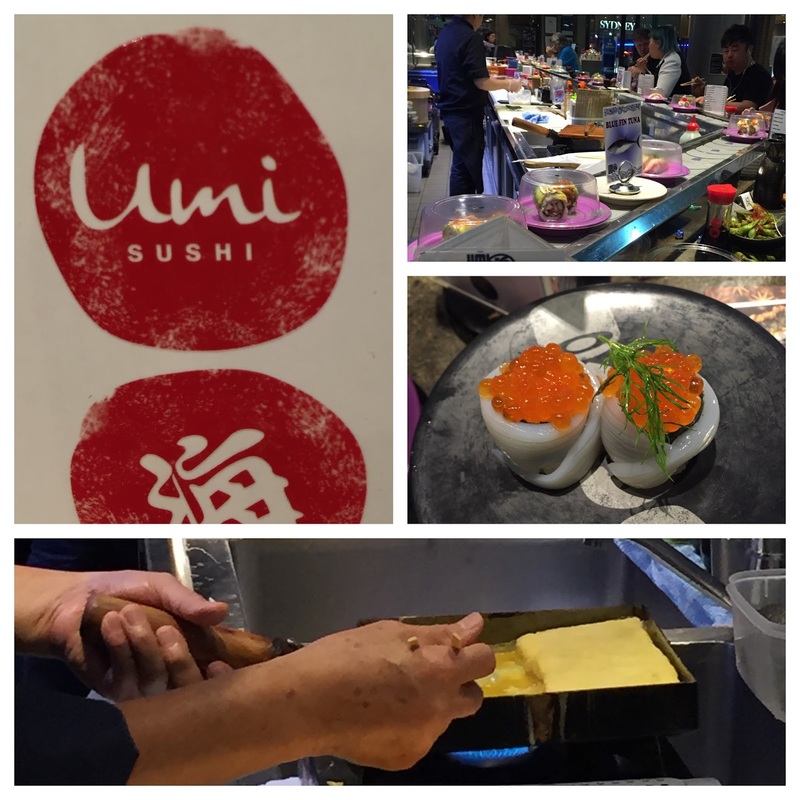 The sushi chefs are really friendly and you get a good show and they talk to you. The bottom picture was a picture of the chef making Tamago (Japanese omelette). I managed to snag a video of the process, the guy has definitely mastered the art of making Tamago, he whipped out 6 of them while we sat there and he made it look effortless. If I manage to figure out how to use the movie software I'll post it. I'll confess when we first arrived I was not super impressed with any of the places we visited. I actually still have a ban on Vietnamese restaurants having tried five of them with complete disappointment. But things are picking up, there's just so many places it takes some looking to find the gems.